One of the most emotionally draining times in a person’s life is when their loved one needs special care, especially one with dementia or Alzheimer’s. Once a family realizes that their older loved one needs care and cannot be independent any longer or live alone, it usually falls on one person in the family to be the major caregiver. Unless that primary person gets support from other members of the family, the consequences for all can become unfortunate. Every family knows who the “leader” is; it could be the oldest or just the most responsible. 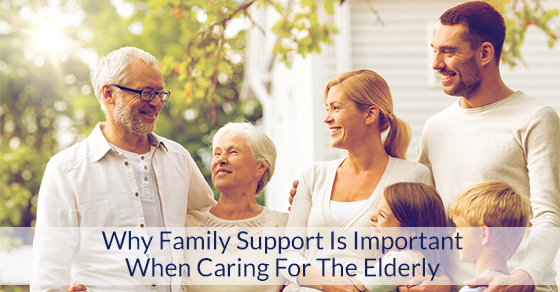 When a loved one becomes ill and cannot care for themselves any longer, someone in the family steps up to be the primary caregiver. In some cases, it is just because of geography and or because that person is closest to the older loved one. It has become common for caregivers to be not only taking care of their own children, but also helping with Alzheimer’s home care. Additionally, it is common that this person also has a full-time job. If it sounds like a daunting task, that’s because it is. If you are that person, we will give you some tips on how to engage family members for support and how to care for yourself. First and foremost, you cannot do it all, especially if you have other life responsibilities. Even if this were your sole task, it is an still a commitment that requires the utmost patience to care for an elderly loved one with dementia or Alzheimer’s disease. Putting it all on yourself ultimately leads to primary care “burnout.” When that happens, everybody loses: you, your family, and your loved one. Dementia and Alzheimer’s home care takes its toll without the proper support system. Ask for help from your family to participate in the care. Accept the help you are given and don’t micro-manage. Accept that you are stressed. Never take on more than you can handle. Find an outside support group. Take care of yourself: take breaks, exercise, eat healthy, find some alone time. Allowing other family members to assist in your caregiving gives them a sense of accomplishment and self-confidence. Maybe your little ones could read to you mother with dementia. Your high school boy could take your dad with Alzheimer’s for short walks or play games with him. Sometimes those little 30-minute breaks can help you get through the day. Most importantly, don’t allow yourself to become isolated. The fatigue and emotional factors of dementia or Alzheimer’s home care can lead to depression and anger. As the symptoms become more erratic and debilitating, it may be time to seek more care than you or your family members can provide. When it becomes too much, you have not failed; you are doing the responsible thing. Professional caregivers can give you the peace of mind and security you and your loved one need and deserve.